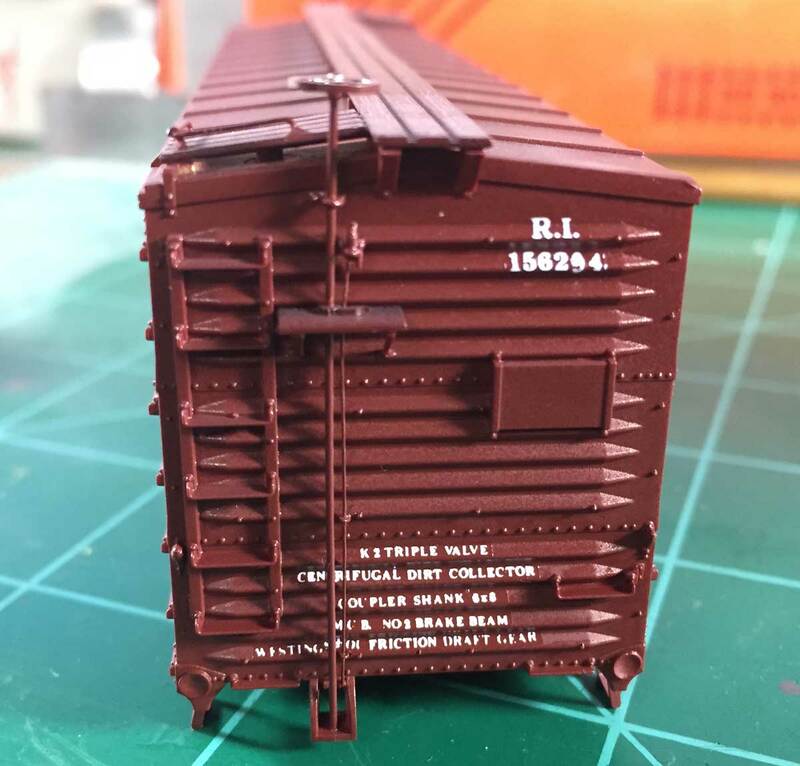 End lettering and detail on a USRA double sheathed box car. I recently started decaling some box cars that I’ve had for a few years. I showed my wife the progress on the Rock Island car seen above and she rolled her eyes and mentioned how difficult the work looked. A comment from a friend in an unrelated conversation a couple of days later hit on a similar note. Our hobby is filled with many different components that require learning several skill sets. We design model railroad layouts using or modifying prototype locations to fit into our limited spaces. We build these layouts with carpentry and engineering skills. Track is wired for electrical control and the digital command control systems many of us employ require programming of variables to customize specific locomotive performances. Backdrops are painted with an eye on reflecting locations or achieving a certain regional appearance. Freight car fleets are researched and models are detailed following prototype information and photographs. The skill sets we use are required to make progress in our hobby. Many of us pick and choose what to focus upon. In my experience, learning one of the more difficult skills to meet a new challenge inspires me to tackle more. The confidence gained as our skills improve can push our hobby enjoyment ever further along. We may not always enjoy specific tasks (like soldering, for me), but we are ready to jump into a new challenge because we have succeeded in previous efforts. These thoughts come to mind as I decal six HO scale, Accurail, USRA double sheathed box cars. The project has spanned about five years, three states, and four homes. Several details have been upgraded. The brake system has been changed to the KC system used in 1926. They were finally painted a few months ago and now Westerfield decals are being applied so these box cars reflect the lettering practices of my 1926 era. There has been a lot of sweat poured into these half dozen cars, but I’ve pushed myself to make these look proper for my model railroad. I have not done major decaling in a long time but these have gone smoothly with only a small hitch or two. Soon, I hope to apply a gloss coat before rolling these through the weathering factory. Six cars with new decals are ready for the next step. While these are not completed models, I’ve been satisfied with each step along the way. Completing one phase makes me look forward to the challenge of the next. The work has raised my confidence level and I’m excited to paint and letter several completed resin kit freight cars as these box car models wrap up. Thanks for stopping by. Your questions and comments can be posted below. Please follow the instructions so your comment can be posted. All comments are reviewed and approved before they appear. Unfortunately, I meet many people in the hobby who avoid learning. They make excuses, or devise work-arounds, or even – sometimes – take pride in their ignorance. With the introduction of so many terrific models in RTR form, I think this is getting worse. I’m not going to say “RTR is ruining the hobby” because it isn’t: It’s allowing more people to build layouts instead of just building models. But I sure don’t understand the attitude of people who do not want to use the hobby as a learning experience. I think they’re missing out. Hopefully, through blogs like yours (and mine), we can convey to those who might enjoy learning more about the hobby just how rewarding – how satisfying – it can be. Thanks for your comments, Trevor. I agree with your points. I try to show others how a little basic work can add a personal touch to the models and set them apart from many others. Using prototype photos as inspiration for weathering is a common suggestion. With some encouragement, many people give it a go and try their hand at something new. But there are some who do not. It reminds me of a Bill Schaumburg editorial in RMC many years ago about the Fear of Failure. I do meet many modelers who are gripped by a fear of ruining something they have invested cash. If they can step beyond their fear to invest time and talent into their purchase, they would end up with a unique model, new skill sets, and the confidence to tackle the next model. I don’t expect everyone to jump on the boat, but I do see many happier modelers who have pushed ahead and tried something new. There’s the money shot! I’ve been working on bringing an ancient wood kit back to life and up to a better standard, and am currently turning my attention to the ends. It is a USRA double sheathed box car lettered for the Wabash, offered by Silver Streak. A previous owner had broken off the poling pockets and filed away a notch above the coupler on the cast metal ends. I am rebuilding them. I have a couple proto photos to work from, but a nice clean shot of an Accurail end is quite useful also! I find that modeling the 20’s provides unique opportunities to speak about our models with non-modelers, such as explaining K-brakes vs AB, poultry cars, ventilated box cars, the American Railway Express, ARA, USRA, etc. I have found that when folks see we’re not just playing with trains but tapping on American History to bring it to life, it adds some credibility to what we’re doing. One thing that this project of yours shows is that 1920s and even 1930s modelers have to pay attention to “core details” for their modeling efforts. In this particular case, it’s paint schemes. Accurail does letter their USRA double sheathed boxcar for all six of the roads you’ve just done. But in each case their lettering is for the LATE 1930s, and for the post-WWII period. Each and every one of them is worthless for someone modeling between 1919 and 1935. So even a “simple” car like an Accurail will require a period modeler to learn to paint and decal their own models in order to replicate the overall “look” of a pre-1950 layout.